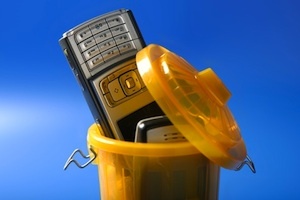 Mexico has finally woken up to the fact that it both needs to and can do a lot more to collect and recycle electronic waste including old cell phones and freezers, given that the majority of such items have tended to end up on dumps even after years of collection efforts. Last month, the National Polytechnic Institute in Mexico (IPN) helped to set up no less than six collection centers, all based around Mexico City. The aim of the campaign is to raise awareness in the community about the contamination that is generated by electronic waste, as well as the crucial importance of disposing of and recycling it in environmentally friendly ways. “The idea is to educate the community to take responsibility for a good they bought which has dangerous components, which can lead to cancer or heavy metals which can contaminate aquifers, lands because their disposal is not contained,” says Gabriela Chavez from the National Polytechnic Institute in Mexico. Local businessman Israel Cruz notes that the great majority of consumers in the country are not even aware that such waste is toxic and has a detrimental effect on the environment, or that they are meant to recycle electronic equipment. The National Polytechnic Institute claims that as much as 50 percent of all electrical waste is still in storage, with an additional 30 percent improperly disposed of in the nation.